Emmanuel CSI Church, Philadelphia is a congregation under the denomination of Church of South India (CSI). The Church is affiliated to the Madha Kerala Diocese. The congregation follows the liturgy, music and spiritual tradition of a CSI congregation in Kerala, India. Sunday Worship service and Holy Sacrament are conducted according to the faith and procedures of the Church of South India in Malayalam and English. The Church activities include Worship Session, Choir, Sunday School, Youth Fellowship, Women’s Fellowship and Mission Services. In the 1st week of October 1981, 9 CSI families from Philadelphia assembled at Mr. George Matthew’s residence and formally decided to start a CSI congregation in Philadelphia. The church was named CSI Church in Philadelphia. The 9 families consisted of: Late Mr. T. C. John & family, Mr. George Thomas & family, Mr. Cherian Abraham & family, Mr. Thomas K Thomas & family, Mr. George Mathew & family, Mr. Samuel Varkey & family, Mr. Varghese Mathew & family, Late Mr. K. M Thomas & family, and Late Mr. C.S Abraham & family. On October 18, 1981, the 1st official CSI service was held in Philadelphia at Zion Lutheran Church on Front and Fisher Streets, with blessing of Rt. Rev. Dr. M.C. Mani. The Rev. Michael John, who later became the Bishop of East Kerala Diocese, assisted by the Very Rev. K.K. Chandy, conducted the Divine service. During the first year, 4 or 5 more families joined our congregation. 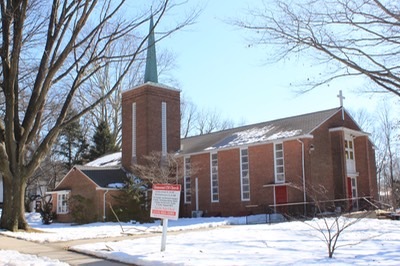 In September 1992 CSI Church in Philadelphia was dissolved and two new congregations were formed, namely The CSI Christ Church in PA and The Holy Trinity CSI Church, Philadelphia. • Very Rev. K.K Chandy, Rev. Johny Joseph, Rev. K.J Abraham, Rev. Thomas Shine, Rev. George Simon, Rev. Thomas Ninan, Rev. T.S. Ninan, Rev. Dr. L.E Sahanam, Rev. Joseph Thomas and Rev. Shajan V. Daniel, Rev.Bejoy Mathew Scaria. We celebrated many birthdays, weddings anniversaries and experienced the passing of loved ones. Many churches measure its success in the number of members they have. However, we choose to measure it in the amount of love and prayers we experience with one another on a daily basis. Thank you and God Bless. Rev. Thomas Ninan & Family, Mr. T.C.John and Family, Mr. George Thomas & Family, Mr. Cherian Abraham & family, Mr. Samuel Varkey & family, Mr. Russal Samuel & Family, Mr. Maxwell P. Gifford & Family, Mr. Mathew Thomas & Family, Mr. Mathew Mangalath & Family, Mr. Mathew Abraham & Family, Mr. Joy P Samuel & Fmaily, Mr. Gigo George& Family, Dr. Koshy Itty Ipe & Family, Dr. Thomas Colacot & Family, Mr. Philip Kurian & Family, Mr. Paul K Joseph & Family, Mrs. Sarama Abraham & Family, Mr. Joseph Koshy & Family, Dr. John C. Koshy & Family, Mr. John Varghese & Family, Mrs. Elizabeth Johnny & Family, Mr. & Mrs. John Moolakalthil, Dr. Benjamin George & Family, Mr. Issac Thomas & Family, Mr. John T Thomas & Family, Mr. Joseph Cherian, and Mr. & Mrs. Shane Koshy.